One day, when Iâ€™m rich and famous, Iâ€™m going to set up the Daily Chrenk Foundation to train journalists who write stories and sub-editors who write the headlines to know what the hell theyâ€™re doing. If I still remember it then, my first grant recipients might be David Leafe and whoever else was involved at â€œThe Daily Mailâ€ in putting together a story based on a new book by Daniel Beer, â€œThe House Of The Dead: Siberian Exile Under The Tsarsâ€. The book, as the title intimates, describes the terrible world of Siberian exile and hard labour, which the Romanov dynasty used for centuries to get rid of criminals as well as political prisoners, and killing two jailbirds with one stone, speed up the development and exploitation of this seemingly limitless and savage but resource-rich province of the Empire. As a Pole, a liberal and a human being, I have very little sympathy for the Romanovs, the Tsardom or the Russian Empire. Tens of thousands of my compatriots throughout the 19th century in particular, the insurgents, revolutionaries and oppositionists, have trod the thousands of miles-long trail of tears to â€œSybirâ€, the geographic location as well as a state of mind that had become a symbol of Russian cruelty and oppression for Poles and countless others. But to write that the Tsars treated the prisoners and exiles â€œas savagely as Stalinâ€ is historical ignorance made print of the highest order. In general â€“ and of course there are always exceptions â€“ there is no comparison in terms of quantity and quality. This is not to detract from the suffering of the Tsarist era convicts, but to remind of communismâ€™s uncanny ability to take any â€œordinaryâ€ horror and elevate it to previously unimaginable levels. 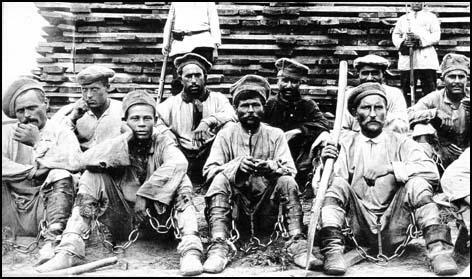 As Anne Applebaum writes in her Pulitzer-winning history â€œGulagâ€, in 1906, in the aftermath of the failed 1905 revolution, some 6,000 convicts were serving sentences across Siberia. In 1939, on the eve of war, it was 5 million, and in 1953, when the devil took Stalin, it was still 2.4 million. Possibly up to 20 million people passed through the system during the Soviet years, of whom an unknown number â€“ well in their millions – perished from execution, starvation, disease and overwork. Lenin, during his Siberian exile in 1897. He was allowed to travel there by himself, and then live in own house. He was allowed to marry, receive unlimited mail, including parcels from his family, own a gun, which he used to hunt, and socialise with other exiles nearby. â€œBy the end of September 1897 everybody was telling him how well he looked, how much weight he put onâ€¦ â€˜This is what shooting and village life do for you! All the Petersburg ailments have been shaken off!â€™ he told his motherâ€¦â€ When his term expired in 1900, he dispatched home five hundred pounds of books he accumulated the during exile (Helen Rappaport, â€œConspirator: Lenin in Exile, The Making of a Revolutionaryâ€). Stalin, during his Siberian exile in 1903. â€œThe exiles eve received pocket-money from The Tsarâ€¦ 8 [roubles] for a peasant such as Stalin â€“ with which to pay for clothes, food and rent. If they received too much money from home, they lost their allowance.â€ In the course of his revolutionary life, Stalin was arrested eight times, exiles seven times, and escaped six times, each time finding enough money to pay for fake documents, train tickets and bribes (Simon Sebag Montefiore â€œYoung Stalinâ€). Perhaps if the Tsars really treated their Siberian prisoners â€œas savagely as Stalinâ€, there would be no Lenins and no Stalins and the history of the 20th century would have been a far happier and less blood-soaked one. Something to bear in mind by â€œThe Daily Mailâ€. Previous Article How racist is your sausage?